What do you get when you remove grains, dairy, nuts, eggs, soy, peanuts, sugar, and all sweeteners from a recipe? You'd think that after removing allllllll those ingredients you'd be left with nothing, wouldn't you? That's the beauty of my no-bake treats. They're free from all the stuff that so many can't eat, yet they're full of flavor and color and goodness. Satisfaction guaranteed! I also have friends who don't or can't eat whole sweeteners due to issues like diabetes or candida. 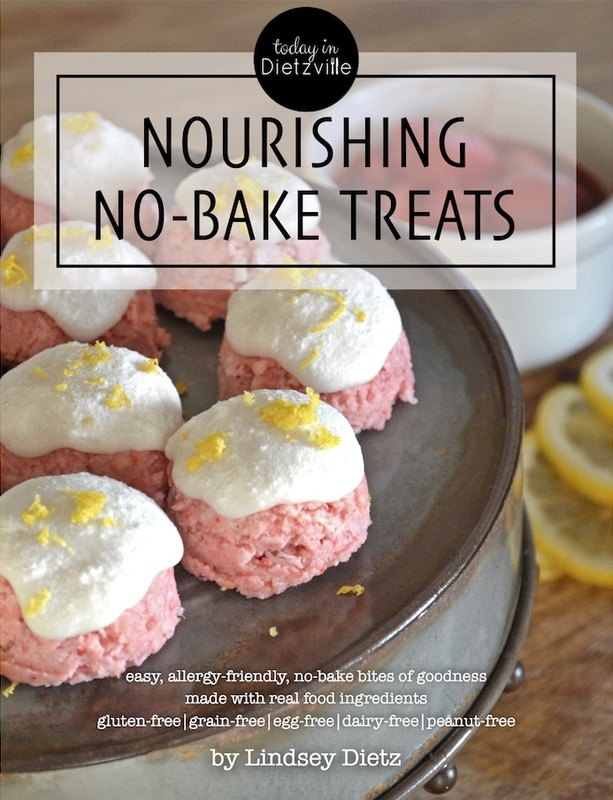 So I wanted to create something yummy and slightly sweet for them to enjoy, just like my other no-bake treats! These went over well with adults and kids! My kids love it when I pack 2 treats in their lunch boxes — they feel like I've made them a special dessert (and they don't even care that there's no sugar!). What do you get when you remove grains, dairy, nuts, eggs, soy, peanuts, sugar, and all sweeteners from a recipe? 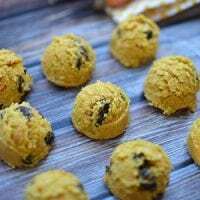 These Carrot Raisin No-Bake Treats! And they're still full of flavor, color, and goodness. Satisfaction guaranteed! 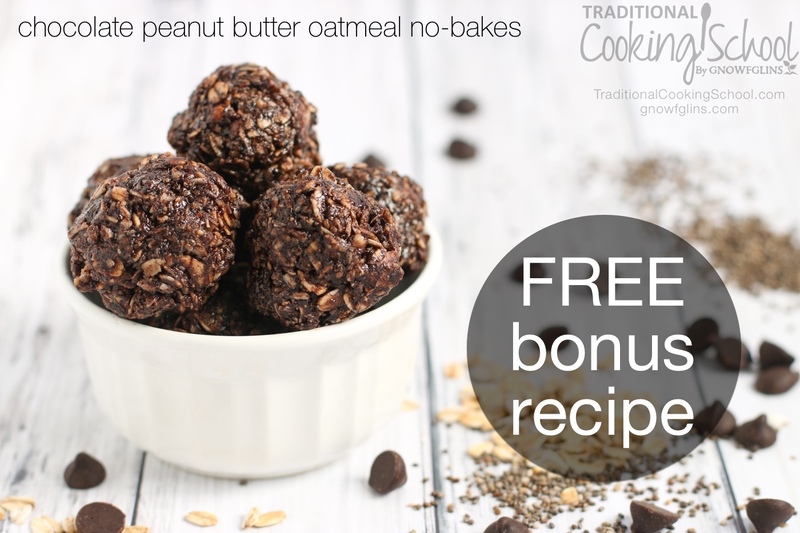 Makes 12 to 15 no-bake cookie bites. In a high-speed blender or food processor, combine coconut, carrots, and coconut oil. Process on low-medium speed, until the ingredients begin to fold in on themselves to create a cookie dough-like consistency. Add a bit of stevia and pulse to combine, if you desire a bit more sweetness. Place balls of dough onto a parchment-lined cookie sheet using a 1-tablespoon dough scoop. Place in the freezer for 10 to 15 minutes to harden. Store in an airtight container in the fridge or freezer for up to 1 month. I used no stevia for one batch and 1/32 teaspoon for another batch, and both were delicious in their own way! My children preferred the batch with the stevia; the folks at a community potluck enjoyed the no-stevia batch. 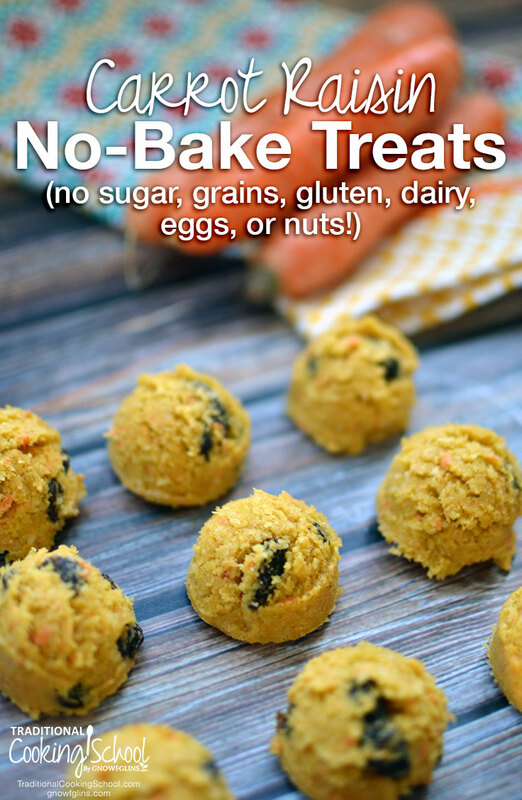 Have you tried some no-bake treats yet? What do you think of this totally sugar-free version? This post was featured in 60 Easy and Nourishing Picnic Recipes, 31 Lunchbox Recipes & Tips For Packing A Nourishing Lunch, and 39 Nourishing Postpartum Freezer Meals To Prepare While You’re Pregnant. DOS this use Rae or cooked carrots? I tried it with raw, and my balls are so crumbly they won’t stay together on the cookie sheet. Suggestions? Such a great idea;I was really hoping it would work. Maybe my blender isn’t high powered enough. I use raw carrots, Sally. I do have a BlendTec high-powered blender, so it does process the coconut quite well, allowing the “dough” to hold together. Perhaps you could add a bit more coconut oil and see if that helps? I’ll try that next time. I added a T. of sesame paste and blendered it with the raisins. I manage to form the balls, and after chilling, tested 1. Wow! REALLY yummy. Thanks! Maybe this will be my year to upgrade my blender, smile. Meanwhile, these will be shared at our church lunch tomorrow. BTW, I used 1/16 t. of green stevia powder. Yay!! I’m so glad you enjoyed them! Ugh. Does this use raw or cooked carrots, I meant. I also had a very dry ‘dough’ using my food processor. I wondered if it was the type of coconut. I had a choice of shredded and finely shredded. I chose the fine. Would the larger flakes have had more moisture? I added a bit more oil then mashed the dough into an ice cube tray to freeze. They are still a bit crumbly, but tasty.